Stray Dog Arts: You're Invited!! An Opening Reception to Go Down In Stray Dog Arts History! You're Invited!! An Opening Reception to Go Down In Stray Dog Arts History! 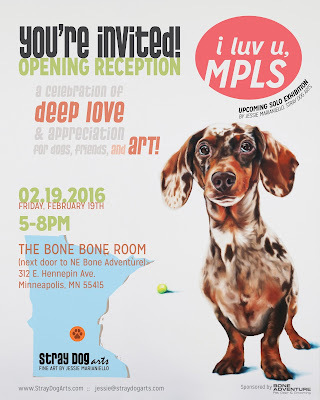 Friends, family, animal lovers, art lovers, my dear community and even strangers far and wide...YOU'RE INVITED to the Opening Reception of my upcoming solo exhbition: "i luv u, MPLS!" This show has been nearly three years in the making and is my biggest exhibiton to date! "i luv u, MPLS!" is a gratitude show and my way of saying THANK YOU Minneapolis for supporting me as an artist! As an artist, I love the way both art and dogs bring people together, creating a common ground between those who might otherwise remain strangers. Incredibly, I'm lucky enough to experience a life that includes both! Once upon a time, I didn't believe it was possible to fully support myself as an artist. But then something happened: Minneapolis proved me wrong!! For the past 8 years I've been living my dream and loving what I do. It's taken me around the world and back again. And now? It's time to have a show in celebration of YOU! As much as this is a show of gratitude, it will also a show of goodbye. With a heart full of love and deep thanksgiving, I will soon be moving to Africa to follow a call on my life where I'll be using my energy, talents and tendencies in new ways as I start an organization (The JOY Collective) working with widows and vulnerable children. Just over a year ago, my life was turned upside down when my fiancé, Carl Bratlien, was tragically killed in a car accident. It has been a year of great difficulty, but also of great healing. I've had a powerful community of folks standing by my side through all of it, including my clients and animal loving cohorts. Tragedy is pulling me forward in new ways and Stray Dog Arts has prepared me for much of it. I am as ready as ever to let the greatness of these past 8 years evolve in the direction of where this life is leading me next. With my whole heart, I hope to share this beautiful night of friendship, love, dogs and art with you. Thank you for showing me how absolutely possible it is to follow my heart and be supported in doing so. With much love, I hope to see you on Friday, February 19th! Interested in inviting others? PLEASE do! We would LOVE it if you would help us spread the word by letting others know about the opening night! Friends, family, neighbors, co-workers, your dog's best friends...whoever you'd like! This event will also be a fundraising opportunity for Red Lake Rosie's Rescue. We'd love a crowd in support of the good work they do and so, together, let's create one! MAY ALL DOGS (and you!) BE HAPPY!! !